Mike and I went to Greece with really no expectations - a lot of our friends who had been admitted they didn't like it - so we really went in thinking if nothing else, we could just hang out in our hotel room and relax. We found Athens to be fun and lively and the Greek people are some of the nicest, kindest and sweetest people we have ever met. 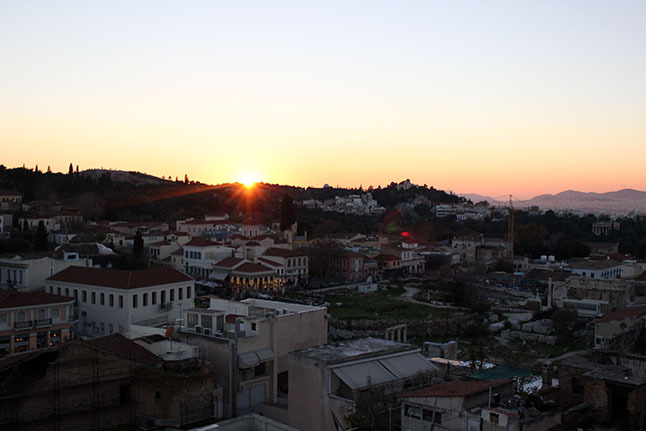 I have such fond memories of our time in Athens and I encourage everyone to visit if you can. The day we went up to the Acropolis it was rainy and freezing cold but it was still so incredible to make the trek up to the top. My favourite part was the Erechtheion, in high school my classics teacher spoke highly of the beauty of the columns (which are Greek maidens) because it is able to support the roof without making the women's neck look stocky. I was able to admire the originals up close in the Acropolis Museum and I can absolutely understand why he found them so captivating. The rain did put us off a little because some areas felt a little dangerous with how slippery it was, so I would love to go back when it's sunny. The Agora was the centre of all life in Athens - much like the Forum in Rome. Unlike the Forum though the Agora has been allowed to return to nature - which in many ways just makes it more beautiful; all the trees and bushes slowly enveloping the birth place of democracy and philosophy. We went to the agora on the same day as the Acropolis and because it was cold and wet we had the place almost to ourselves. It was so peaceful - and I feel so lucky to have experienced it the way we did. Although there are downsides to travelling over winter - there is also something to be said for having the Athenian Agora to yourself! This museum is frankly pure genius. As well as telling the tale of Athenian history it also houses the originals of all of the frescos and many of the statues of the Acropolis. Not content with that - they have replicated the main temple of the Acropolis to scale inside the museum, to ensure you get the full impact of the frescos as they appear on top of the mountain. The floor on the bottom level is see through to allow you to see the archaeological dig that is occurring under the museum. Honestly, by the time we made it here we were a bit over museums so I didn't feel like I really enjoyed it the way I enjoyed the Acropolis Museum. By far the most incredible thng to see was the Antikythera mechanism. It's considered the "first computer" and for a history nerd like me it has always been a source of fascination. It didn't occur to me that it would be housed in the museum - but I was so excited once I realised it was. It's so much smaller than I imagined, but also 20 times more intricate. Truly, it is an incredible thing to see. First let me say, food in Athens is amazing. . Now I'm not talking fancy food here - everywhere we ate made simple and incredibly hearty food. On top of this the Greek hospitality came out in spades. Everywhere we went people were so friendly and keen to help you have a good time. Free bread (normally with tapenade) and water (unheard of in Italy) was the norm. Plus on multiple occasions they would bring out an after dinner shot (I know it's called raki on Crete - and we took to calling it raki in Athens and they knew what we meant). It ranged in flavour/strength from paint stripper to warm cinnamon spice and it was such a fun way to end the night. A word of warning - although Greece follows the same smoking regulations as the rest of the EU they take a pretty...liberal approach to them. Essentially if you aren't a smoker and you don't want to marinate in cigarette smoke I do encourage you to sit outside (weather permitting of course). This was definitely our favourite restaurant in Athens - the portions were hearty and so insanely delicious - and to top it off - crazy affordable. They also have a fantastic drinks range - I recommend Mythos beer or sangria. I think my favourite thing about Efcharis was the atmosphere. Like most Athenian restaurants they had a spruiker out the front encouraging people to come in - and we really enjoyed watching him work his magic. They also had live music playing, on our last night in Greece we went there and sat inside. Traditional Greek music was playing and the table behind us, bolstered by liquid courage, got up and started to dance. In the restaurant. During peak service. It was one of the coolest things that has ever happened to me - and it really captures in my head the verve and vibrancy that we experienced in Greece. I definitey recommend the Plaka hotel - it's right in the middle of the tourist part of the city but it's also very affordable (always a plus side). The beds are comfy, the bathroom clean and pleasant, breakfast is included and the staff insanely nice and helpful. If this isn't enough to sway you to stay here, the only other thing I can add is the above photo was taken from the rooftop bar of our hotel. And if having an evening wine whilst looking out over the Acropolis isn't enough to convince you - I doubt anything would.